Hyenas are some of the greatest African Savannah predators. They rule the animal kingdom and when the hyenas attack, no animal is spared as far as size and number is concerned. Is it true that hyenas are different from other wild animals found in Kenya Tanzania South Africa and the rest of the African wild dangerous forests where hyenas live? Despite the fact that these hyenas look as if they are limping uphill due to the fact that they have longer legs at the front, they are just as perfect as any other great wild animal around the globe. 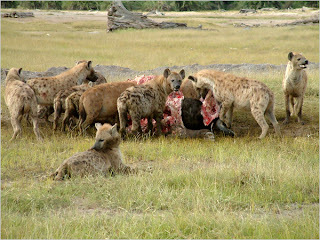 As wild as a hyena can be is the same way these social animal social bond can be sometimes. One amazing fact about these dangerous beautiful hyenas is that the hyena is one of the most dangerous animals in the world and it’s the only animal in the wild that chase a lion in the wild while it is eating after hunting its prey. There are many animal videos about hyenas which truly show the act of these graceful animals really advancing and intimidating other wild cats or wild animals and take over the animals which have been hunted. Although some of these snatching of meat or food does not come easy, there are incidences where the great hyena has to suffer consequences and as a result many hyenas have ended up being attacked by some of the African big cats as they keep on defending their natural habitat, feeding and breeding grounds. Hyenas are animals which are always full of energy and with their strong powerful teeth, hyenas tend to act and control their habitat and when people on safaris to Africa tome to see these great predators of the African Savannah, they are always thrilled to see how this brave animal has been able to survive and at the same time played a very important part in the food chain as one of the greatest animals in Africa. One might always wonder if hyenas are not part of the Big cat family, where did these great beasts come from? Are they part of the Dog family or are they just animals of their own species? These are some of the most frequently asked questions about hyenas. As far as data and information about hyenas is concerned hyenas are not members of the canid (dog) or family (cat) families as many people might have thought. These beautiful dangerous African safari animals belong to their own family and at the same time have their own, Hyaenidae. When it comes to the hyena’s groupings and the hyena’s distinctions is concerned, these African savannah hyenas and many other hyenas species come from only 4 members of the Hyaenidae family. 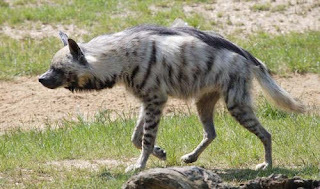 Because of the different natural habitat and geographical distribution of the hyenas found in the wild, the hyena species which are mostly found in Africa are the spotted hyena Crocuta crocuta and some of the endangered hyenas found in isolated areas are the endangered striped hyena hyenas which are rarely seen in the wild. The brown hyena Parahyaena brunnea which is always a rare show to the wild while going hunting and lastly the rear endangered aardwolf Proteles cristatus (it’s a hyena, not a wolf). These great predators love the African Savannahs due to the availability of food from all angles and from all seasons. 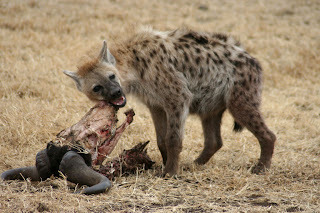 The hyena is an animal which tends to eat anything which is live to a carcass which could be as old as the bones can say and as such the hyenas have been famous and are nicknamed as the “scourge of the Serengeti,”. People are always astonished the way these hyenas eat. Given the fact that the hyenas can eat almost a third of their body weight is something these animals keep on amazing people. The hyenas wherever they are play a very big part in the ecosystem of their natural habitat in the wild and some of the greatest times and places to see these hyenas in action is always during the wildebeest migration where these beautiful dangerous safari animals will always chase wildebeest big or young and start eating the animal being hunted alive. By the time the hunted animal is dead, it is already half eaten and dies because of bleeding which is just life in the jungle as natural selection and survival of the fittest is part of what makes nature in the great African Savannah habitat to flourish with the existing wild life of Africa. Iğdır Province, with 25 children and 3 adults being wounded in one year. Hyenas either in the forest or whether these animals are in the deserts will always eat and clean up any animal carcasses or leftovers by other animals and as a result these hyenas take part in natures natural recycling and keeping the earth free of unwanted dead bodies of animals which other scavengers might have refused to eat as there is always fresh to eat or may other animals to hunt while in the wild. One amazing hyena fun fact is that people say that the hyenas head is somehow funny. If there are great animals in the wild which look beautiful, the hyena is one of the animals which people say doesn't have a beautiful head but because beauty comes in many forms sizes and shapes, as far as the hyena is concerned, it’s as beautiful as any other animal found in its species as well. 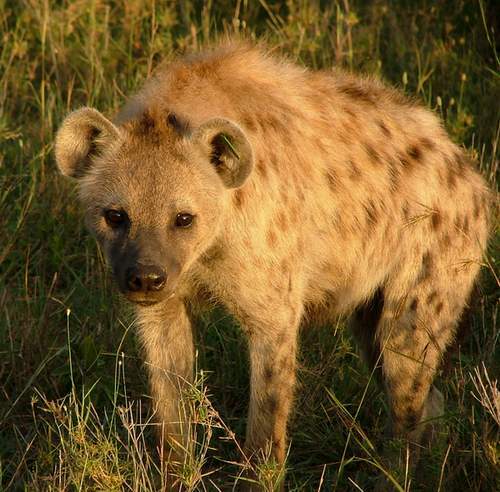 Actually how do hyenas look? 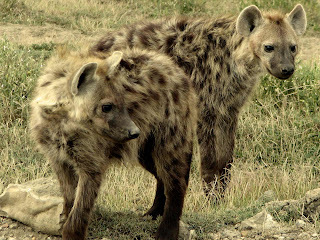 What is the difference between the different hyena species? One thing to keep in mind about hyenas is that the striped hyenas have big broad heads with somehow dark eyes. At the same time the stripped hyenas have very thick muzzles and somehow large pointed ears to detect all the combustion that takes place in its surrounding and pinpoint where to get the next hunt for its meal. One amazing fact about these hyenas is that the muzzle and ears of the hyena are black. 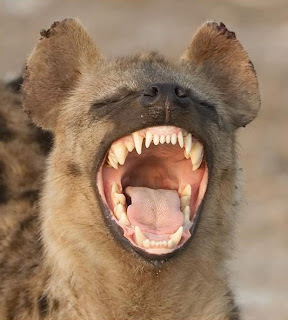 At the same time you find that the hyena’s throat is also completely black. The hyena’s physical appearance is unique in a sense that some of the hyena species have different coats or skin. The natural habitat of the hyena always plays a very important role in the survival of the hyenas in the wild as they need to blend with their natural surrounding in order for them not to be easily spotted by other animals or prey and also to act as an advantage while hunting as well. The coat or the skin of hyenas can sometime be golden yellow, brown, or gray with a blend of black stripes on the body and legs of the hyena. These beautiful African safari animals can camouflage themselves easily and very well in tall, dry golden grass which covers the natural habitat of Africa. 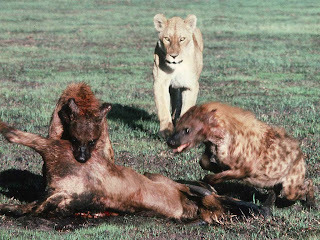 This is one of the amazing ways in which the African hyenas have been able to blend with their surroundings and surprise their enemies in many surprise animal attacks. study abroad class at Kenya’s Masai Mara National Reserve. There is something special about hyenas in the way they walk. 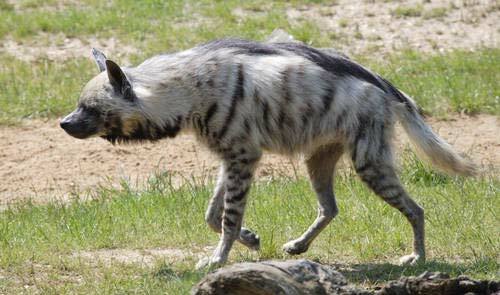 Have you ever noticed how a hyena walks? 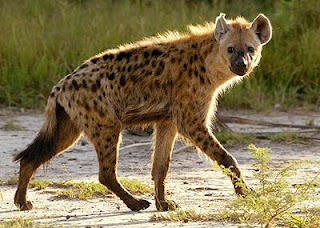 Do you think a hyena walks like any other animal in the wild? I mean a hyena has four legs just like any other wild animal but if you really take a closer look you will find that a hyena walks a little bit different from other animals which are out there. These animals can run and can even run for miles but their amazing legs feature about hyenas is what makes them look small from behind while appear big from the shoulder till the head. Another amazing fun fact about hyenas is that the hyena’s front legs are a little bit longer than the hind legs. This walking appearance can be easily noticed when you see a hyena walking from a distance and can also be captured by a camera for all these people who are out there on a safari to really capture this amazing physical appearance which no other animal in the animal kingdom has and especially in the realm of the African wildlife heritage as a whole. As a matter of fact you might be astonished to note that whether the hyena’s front legs are bigger than the hind legs, the hyena does not mind or is not affected at all by these unique characteristics of the hyena’s legs. These great animals of the Savannah habitat and Africa as a whole will walk miles and outrun their prey over long distances in search of food and the smell of fresh food of blood miles away. As far as walking is concerned for the hyena, hyenas can walk with ease and have no problems with them having bigger legs in the front or having shorter legs. Another amazing fact about hyenas is that just like the baby cheetah and the leopard, the hyena has a lot of mane at the back of its neck and shoulders which almost makes the hyena looks twice its size. 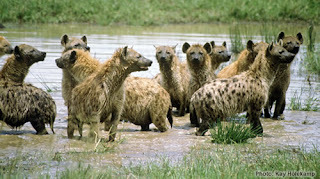 This is one of the very useful natural instinct which the hyena uses when it is in danger or when the hyena is excited. These are just some of the few good qualities that hyenas possess as a way of keeping itself alive in the wild. Communication in the animal kingdom is one of the basics which baby animals are taught or just learn as they grownup in the heard. 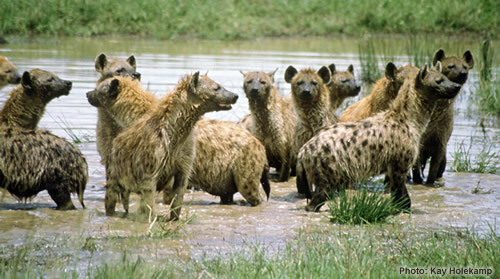 Hyenas do communicate just like many of the wild animals and other big cats as well. The different body postures of a hyena can communicate a number of things from a hyena feeling hungry a hyena feeling pain and a hyena feeling good after a nice meal or just having fun with the environment which could be changing with the different seasonal rains of Africa. the hyena’s tail movement as well as its body posture and position always communicates a message which only hyenas can understand while they are feeding or going hunting. Sometimes when the hyenas seem to be in places where they are not supposed to be, being in the wrong hyena territory can be very problematic and as a hyena you just need to learn the body language and decide whether to make a run for it or just blend in but watching your back for any sudden attacks which might just be forthcoming from the head of the heard. I appreciate your effort to share some kind of information with us remarkable for revisiting.